An analysis of gravity and topography data from Saturn's largest moon, Titan, has revealed unexpected features of the moon's outer ice shell. 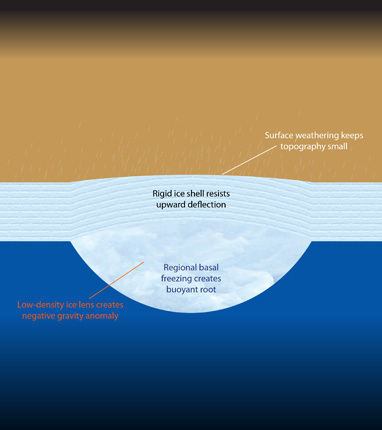 The best explanation for the findings, the authors said, is that Titan's ice shell is rigid and that relatively small topographic features on the surface are associated with large roots extending into the underlying ocean. The study is published in the August 29 issue of the journal Nature. Led by planetary scientists Douglas Hemingway and Francis Nimmo at the University of California, Santa Cruz, the study used new data from NASA's Cassini spacecraft. The researchers were surprised to find a negative correlation between the gravity and topography signals on Titan. "Normally, if you fly over a mountain, you expect to see an increase in gravity due to the extra mass of the mountain. On Titan, when you fly over a mountain the gravity gets lower. That's a very odd observation," said Nimmo, a professor of Earth and planetary sciences at UC Santa Cruz. To explain that observation, the researchers developed a model in which each bump in the topography on the surface of Titan is offset by a deeper "root" big enough to overwhelm the gravitational effect of the bump on the surface. The root is like an iceberg extending below the ice shell into the ocean underneath it. "Because ice is lower density than water, you get less gravity when you have a big chunk of ice there than when you have water," Nimmo explained. An iceberg floating in water is in equilibrium, its buoyancy balancing out its weight. In this model of Titan, however, the roots extending below the ice sheet are so much bigger than the bumps on the surface that their buoyancy is pushing them up against the ice sheet. "It's like a big beach ball under the ice sheet pushing up on it, and the only way to keep it submerged is if the ice sheet is strong," said Hemingway, a doctoral candidate in planetary geophysics at UCSC and lead author of the paper. "If large roots are the reason for the negative correlation, it means that Titan's ice shell must have a very thick rigid layer." The researchers calculated that, in this model, Titan's ice shell would have to have a rigid layer at least 40 kilometers thick. They also found that hundreds of meters of surface erosion and deposition are needed to account for the observed imbalance between the large roots and small surface topography. The results from their model are similar to estimates obtained by geomorphologists studying the erosion of impact craters and other features on Titan. These findings have several implications. For example, a thick rigid ice shell makes it very difficult to produce ice volcanoes, which some have proposed to explain certain features seen on the surface. Unlike Earth's geologically active crust, Titan's ice shell isn't getting recycled by convection or plate tectonics. "It's just sitting there, and weather and erosion are acting on it, moving stuff around and redepositing sediments," Nimmo said. "It may be like the surface of Earth would be if you turned plate tectonics off." The researchers are not sure what could have given rise to Titan's topographical features with their deep roots. Titan's eccentric orbit around Saturn generates tides that flex the moon's surface and create tidal heating, which could cause variations to develop in the thickness of the ice shell, Hemingway said. In addition to Hemingway and Nimmo, the coauthors of the paper include Howard Zebker at Stanford University and Luciano Iess at the Sapienza University of Rome. This research was supported in part by NASA. The Cassini-Huygens mission is a cooperative project of NASA, the European Space Agency, and the Italian Space Agency. More information on the Cassini mission is available online from NASA and the Jet Propulsion Laboratory.